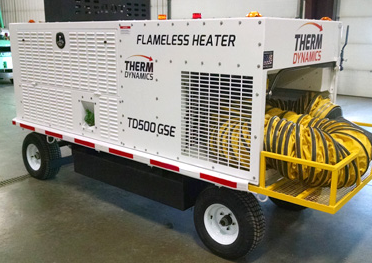 The TD 500 GSE “Flameless” Airline Heat Cart represents over 18 years of field experience, operating 24/7 in extreme conditions in the Gas & Oil Industry. The same safe flameless heat technology demanded by insurers and site safety managers in these “extreme explosive environments” is now available for the airline industry. The TD 500-GSE (Heat Cart) is compact, completely portable and safe- providing Clean Dry Heat for aircraft, hangars and ground support equipment. It represents the “next generation” in portable heat technology. Heating for aircraft cabins, fluid lines and luggage bays. Preheat aircraft engines and ice removal on jet turbine blades. Heating for remote, “off gate” aircraft, ground support equipment and facilities to improve productivity and work place safety. Hanger heating while servicing aircraft and other GSE equipment. Moisture drying and ice melting of luggage bays, maintenance facilities and ground equipment.